Hey Hey! Happy Sunday to you all! If you're anywhere near Illinois, Indiana or Ohio I wish you all a safe day. There's a lot of talk about big storms coming through and I am praying it's not as bad as they're saying. Now, on to something happy! I know it's only November 17th, but I am just overcome with the holiday spirit! I have had Christmas music on constantly in my car and around the house. We already put up (and turn on) our outside Christmas lights. I'm currently sipping awesome hot cocoa and watching a Christmas movie on the best channel ever The Hallmark Channel, and I've been falling asleep to A Mickey's Christmas Carol the past couple nights. I am definitely the Crazy Holiday Lady. Proud of it! This is the tried and true recipe you can find on Chex website. It's so perfect, I don't even change it. This has been showing up at our family Christmas parties for years! It's so easy and fun to make. First you'll measure out the cereal in a large bowl for later (see above). Cover a baking sheet with parchment paper and set aside. Then combine the chocolate chips, peanut butter & butter in a microwave safe bowl. Heat in the microwave until the mixture is nice and smooth. Add the vanilla. 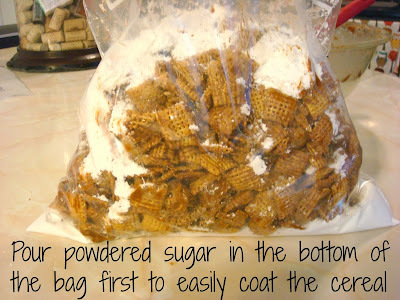 Then pour over the cereal and toss until evenly coated. My bowl has a lid I can put on so I can shake the bowl like crazy and get each piece covered in peanut butter and chocolate awesomeness. If you don't have a lid, use a wooden spoon or spatula. Take some powdered sugar and put it at the bottom of a freezer bag, pour in coated cereal and sprinkle the remaining powdered sugar on top. Spread the puppy chow onto a baking sheet and let cool. 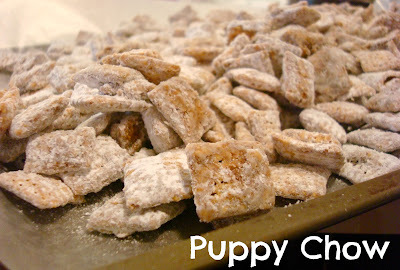 Or just dig right in not caring at all that you have powdered sugar on your nose, cheeks and fingers because you're so darn happy you're eating this! 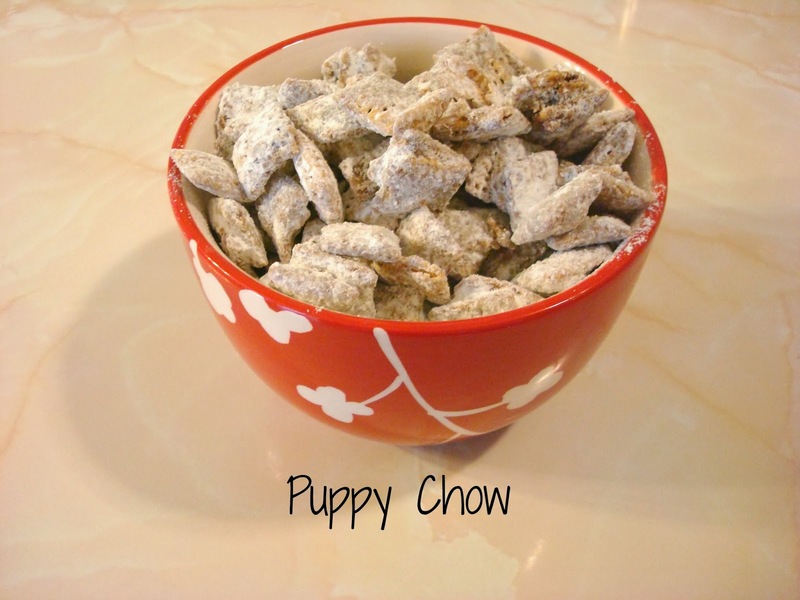 Pour cereal into a large bowl and set aside. Line a large baking sheet with parchment paper for later use. In a medium microwave-safe bowl combine the chocolate, peanut butter and butter and microwave for one minute. Take out and stir. Microwave for an additional 30-45 seconds, or until it's super smooth and easy to pour. Stir in the vanilla. Pour the chocolate mixture over the cereal and stir to coat all the pieces. 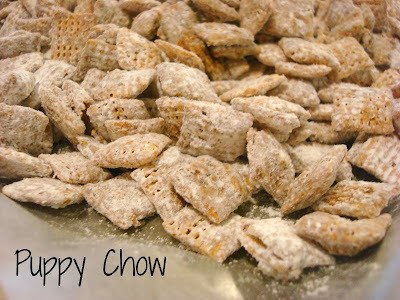 Place 1/2 a cup of powdered sugar into a large ziploc bag, top it with the cereal, then remaining powdered sugar. 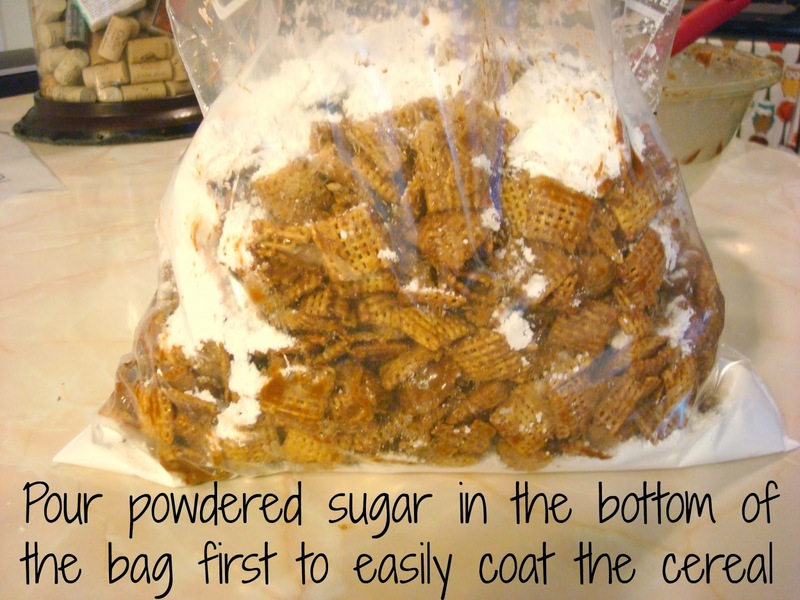 Close the bag and shake the cereal until all pieces are covered in sugar. 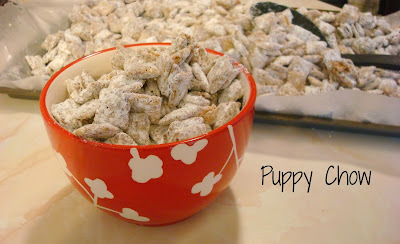 Spread the puppy chow onto the lined baking sheet and allow to cool. Serve and enjoy! I'm headed downstairs to go grab a handful! What does your family love to make this time of year? My favorite holiday staple is by far the mashed potatoes! What's yours? Delicious! I can snack on these all day. Lovely post. The only problem with this is, I can't stop eating it. Thanks for linking to What'd You Do This Weekend..